At 8:24am it was all done and dusted. 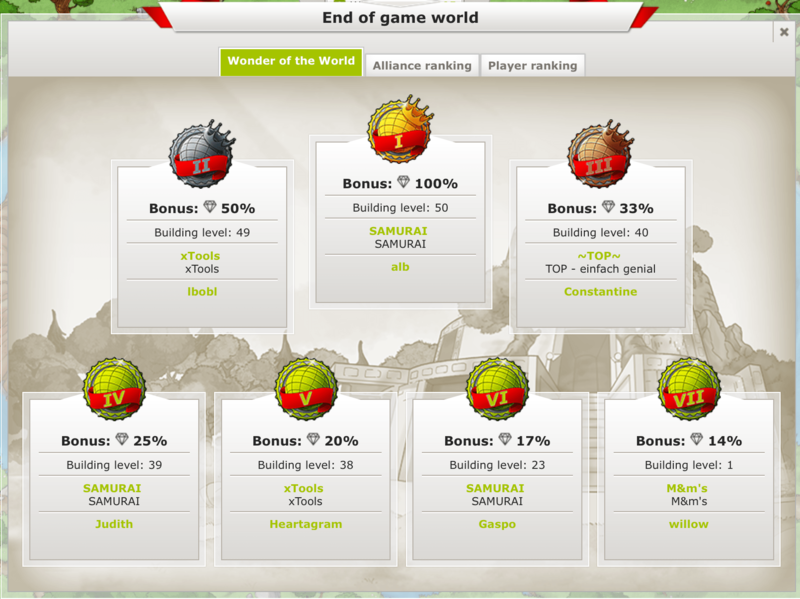 “alb” became the first player to finish their Wonder of the World at level 50 and scored victory for the SAMURAI, of which I am also a member. This marks the end of the Travian V Closed Beta. All the players were happy to see this good result despite the ups and downs along the way. Following the congratulations from each of the players, we promised to meet each other again in the coming T5 Beta. We have already set ourselves a clear challenge: Once again, we aim to be the alliance that completes the Wonder of the World. But there is much more than just us, the round’s winners. Other alliances and their players also built Wonders of the World in the hope of winning the game. I can’t forget to mention them as well and to thank them for making this a fair fight. The battle for the completion of the Wonder of the World was a fierce and close fight. Thanks go out to “|bob|” and “Heartagramm” with their alliance “xtools”, as well as to “Constantine” of “~TOP~” and, last but not least, to “willow” of the “M&M’s”, who managed to steal a WW in the last minute. It has been a pleasure playing with you all. What’s next? Of course I hope to see all my friends again in the Open Beta. Until it starts, a specially-created Skype chat will have to be our way of staying in touch with other alliance members. Most of the chat is Travian-related anyway. For example about what should still be changed in the game, or what game extension people are would like. Or what could have been done better. No doubt, the time until the start of the Open Beta will pass very quickly. Thanks to all your feedback, there is more good news: The Beta Chronicles will continue with the Open Beta. I’m really looking forward to it! What are your thoughts on the Closed Beta? Was it a fierce final battle or was it quiet for you? Leave us a comment. Also looking forward to it! Do you maybe have a little hint, when the open beta could be starting? Cause I´m already way to excited, and I have to say, there are not alot of informations about that around. Not even if its already been planed or not. I have to wait on my own to get that date from a dev-member. I thought the WW had to reach 100, not 50. Also, what are the ‘bonus’ things? You get Gold for winning a world? yep closed beta is over now.